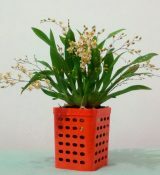 Orchids need a moist atmosphere and that can be a problem in a centrally-heated room. (see the many posts I’ve created on this blog for plant specific growing guidelines). With an ‘easy’ type such as Paphiopedilum, you can get away with misting the leaves frequently in the summer and occasionally in the winter, or by surrounding the post with other house plants. For more demanding orchids, however, a pebble tray is necessary. Sponging the leaves occasionally with tepid water will provide additional help, but for some tropical varieties the only satisfactory answer is t grow them in a glass-sided container known as a terrarium.